News arrives from Claude Niek at CSO Yachts of a further price reduction on his central listing, the 55m motor yacht Obsession. Delivered by Australia’s Oceanfast yard in 1991 to a design by Phil Curran, she’s ABS classed and MCA compliant, and this superyacht had a thorough refit in 2008, including an engine overhaul back to zero hours. A popular charter yacht, Obsession’s Jon Bannenberg interior, refreshed during her refit, sleeps up to 12 guests in a master, VIP, two doubles and one twin cabin. 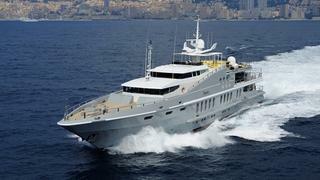 Obsession is now asking $19.95 million, down from $21 million.